What Percentage Of Clicks Go To Paid Ads? I will start by saying this, SEO is not an exact science. Many SEO’s have tried for years to pin down this number and after thorough testing there seems to be a consensus. I had a very interesting conversation recently with a SEO colleague of mine on the subject of Paid vs Organic search. We had two competing hypothesis’ on which we thought was more effective for building recurring visitors to website. Personally, I come from the camp that is skeptical of just how effective paid ads are for recurring traffic but let’s investigate the numbers. What Are Paid Ads vs Organic Search? In order to understand the statistics we first have to define what are paid ads vs organic search. 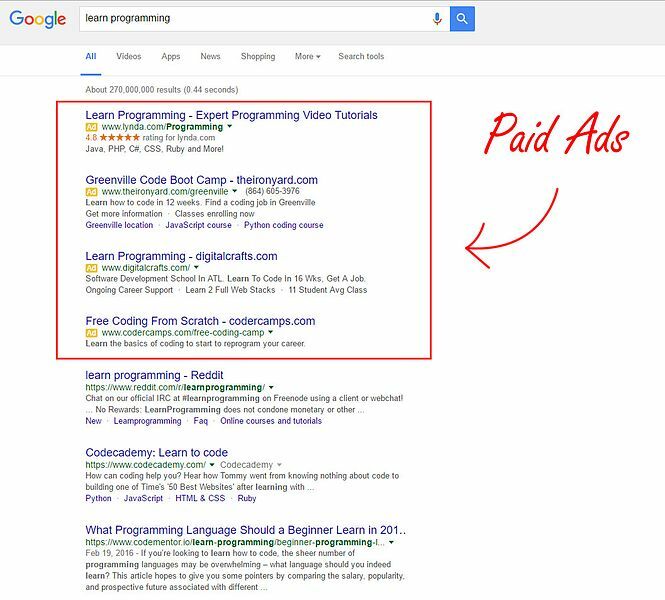 Paid ads are the links you see at the top of a search result page and also on the right side. They are normally directly tied to your search inquiry and they pay to be listed for that search inquiry. Organic search is where the real game is played below that. These are the results that Google deems most related to your inquiry. They do not pay to be there, directly and are shown based on a complex set of factors that Google treats like the secret recipe of KFC chicken spices. Well, that is both complicated and simple depending on how you view demographics. Different demographics of users like gender, age and country have different results but here in the US the average percentage of people who actually click on paid as is….drum roll please! That’s right, only SIX percent of clicks go to paid ads. Why you ask? That is a question that has long been pondered but I have my own theory. In life there a few universal truths that I think hold dear and one of them is no one likes to be sold to. People are conditioned today to ignore advertisements and commercials on TV shows, radio, Hulu ect. Google is no different when you are searching for an a specific thing. We instinctively look past the ads and go to websites that are organic results because we believe weather true or not, these companies are the best in the area and if they have earned Googles trust, they can have ours. This has far reaching implications in my eyes. It solidifies the fact that content driven SEO for organic search is king today. Paid ads have their place and can be incredibly effective and driving traffic to a website but those gains are not usually sustained. They also cost you money. Personally, I think spending that money on good keyword rich content creation is better for small budgets and many others agree. Organic search is what you should be focusing on. Home Our Story Contact Web Design & Development SEO Website Maintenance Branding & Logo Design Social Media Marketing Content Marketing Website Hosting You are here: Home » Marketing » What Percentage Of Clicks Go To Paid Ads?